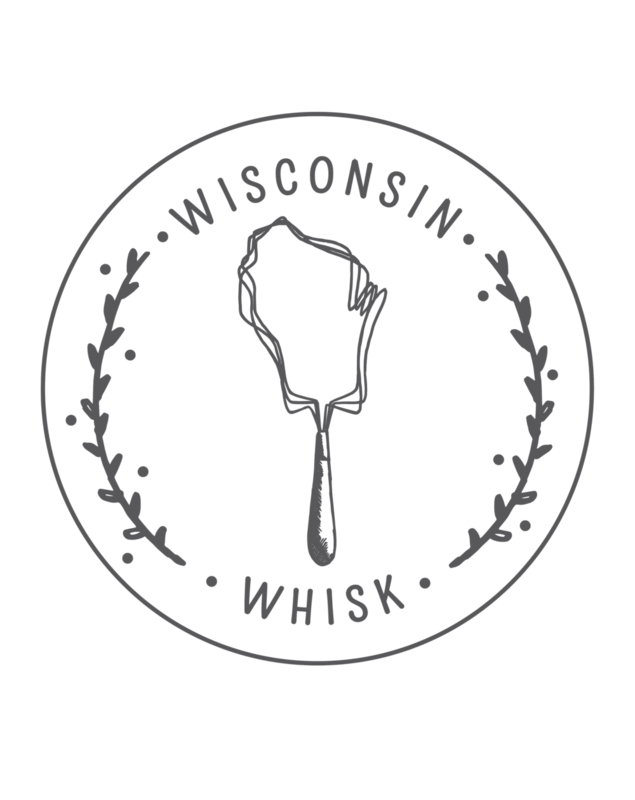 Last week was a crazy busy week here at Wisconsin from Scratch. Prepping for the biggest food holiday of the year is a lot of work, even when you’re not the one hosting. This year, we spent Thanksgiving with my family in the Twin Cities, which is always a good place to visit. Pies were made, turkeys were grilled, and brussels sprouts were roasted to spicy perfection. It was a wonderful Thanksgiving. But like all good things, the long holiday weekend had to come to an end. So, we returned home after the holiday tired, hungry (somehow? ), and definitely not in the mood for a grocery store trip. And so I went about scouring the house for something to cook. Something tasty, but not too reminiscent of the Thanksgiving leftovers we had been feasting on over the last few days. Lucky for us, I was able to track down some delicious root vegetables left over from our CSA. Carrots, celeriac, rutabaga, potatoes; I knew we were in for something good. I should also mention that I’ve been on a serious biscuit kick lately. I mean, who doesn’t love a nice batch of biscuits straight out of the oven? 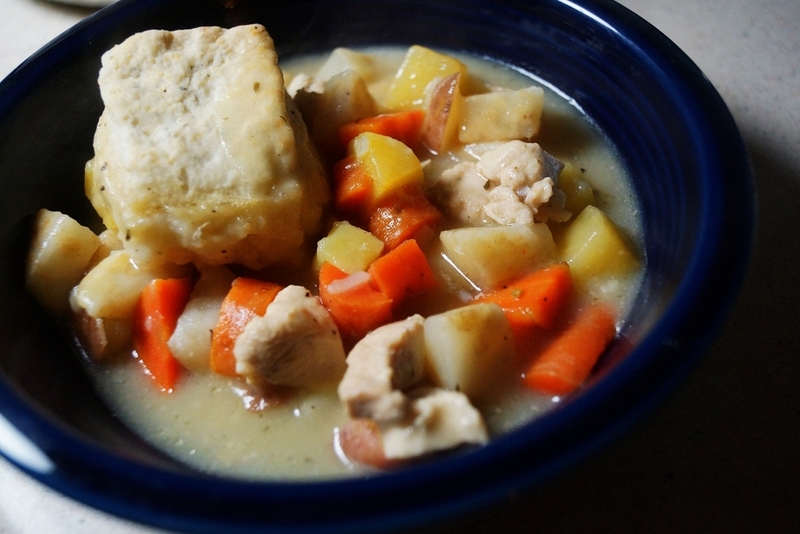 So in keeping with the biscuit trend, I decided to make a chicken and root vegetable stew with parmesan biscuits. And of course, with this sort of thing, one must bake the biscuits on top of the stew, so that they are just a little gooey and fully infused with deliciousness. What could be better? Now, the trick to good biscuits has to do with how you roll them out. You have to fold your dough over a couple of times and keep rolling in order to get big fluffy biscuits with lots of layers. And we all know these are the best kind of biscuits. Also, if you are a fan of perfectly round biscuits, by all means, use a biscuit cutter or glass to cut them out. Personally, I prefer to cut the dough into squares - less work, and there’s no risk of any delicious biscuit dough going to waste as dough scraps. And so, after some chopping, simmering, biscuit rolling, and baking, we were sitting down to a delightful meal made entirely with things we already had around the house. It doesn’t get much better than that. And for those of you still bogged down with leftover turkey, this is a great way to use it up as well. So what are you waiting for? 1. Make biscuit dough - combine flour, baking powder, salt, and pepper in a medium bowl. Using your hands, work the butter into the flour until the pieces are small (about the size of a pea) and the mixture has a grainy texture. Add the milk and parmesan, stirring until a cohesive dough is formed. Wrap dough in plastic wrap and refrigerate while you make the stew. 2. Bring a medium pot of salted water to a boil. Add the chopped root vegetables and boil until they are soft, but still hold their shape, about 8 minutes. Drain vegetables and set aside. 4. In a pan over medium heat, melt 1 Tbsp butter. Add the shallot, herbes de provence or thyme, salt and pepper, and cook until shallot is soft and fragrant, about 2-3 minutes. Add the chicken pieces, and continue cooking until chicken is cooked through, about 5 minutes. Add the chicken broth and bring to a boil, then reduce heat to low. 5. In a small bowl, combine the remaining 2 Tbsp butter and 2 Tbsp flour, mixing until thoroughly combined. Whisk this butter/flour mixture into the hot broth mixture, and continue whisking until broth thickens slightly, about 1-2 minutes. Season to taste with salt and pepper. Mix in the cooked root vegetables, and pour stew into a oven proof casserole dish. 6. Remove biscuit dough from the refrigerator and dust with flour. Using a rolling pin, roll dough out into a large rectangle. Fold dough into thirds, then roll out again. Fold dough into thirds a second time and roll out again. Using a very sharp knife or biscuit cutter, cut dough into 6 equal pieces. 7. Place biscuits evenly on top of stew in the baking dish. Place baking dish into the oven, and bake until biscuits are golden and stew is bubbling, about 30 minutes. Cool slightly before serving.